He attended a state-supported university in our home state. Our family is fortunate to live in a state with a great university that also happens to be one of the most affordable. Tuition and fees are about $8,800 per year and cost of attendance (including room and board) is approximately $25,000 each academic year as estimated by the university. My husband and I saved money for college expenses. I'd like to say that we saved $100,000 in a 529 Plan for my son's education and breezed through paying for tuition, fees, room and board. But we didn't. One reason we didn't save through a 529 Plan is that these accounts didn't exist in North Carolina when he was born, when I was most committed to saving for college. According to Saving for College, 529 Plans associated with North Carolina were launched in 2001, when my son was 7 years old. And, based on my research (and memory), investment choices weren't that great when the plans were introduced. I started saving inside of a UTMA/UGMA account and then moved money to a Coverdell account (then known as an Education IRA). I liked the simplicity of the Coverdell and the ability to choose investments for the account. But I underestimated the increase in college expenses and overestimated my potential growth in investments. My projections left us with a shortfall in terms of college savings. However, we did saved through the Coverdell. This money covered most of his tuition payments. The rest came from our investments and current income. My husband and I paid off our mortgage before our son started college. Not having a monthly mortgage payment helped our cash flow: we could pay some college bills out of current income. Paying off a mortgage — or reducing large bills, such as paying off cars or credit card balances — before a child goes to college can free up money for books, meals at the dining hall, etc. We had extra money in a regular investment account. One of the reasons I didn't save super-aggressively for college is that I knew I had money I could access if needed. We hold some investments in a regular brokerage account. So, we used stock dividends and sold shares of our holdings to pay college expenses when needed. Still, there's a downside of using regular investments: selling investments can trigger capital gains, which can increase income to a level that may prevent you from claiming the federal tax breaks associated with having a child in college. I know some folks are putting money in a Roth IRA with plans to use those investments for college; this set-up could work if you're eligible to contribute to a Roth. But I'd prefer to use retirement money for my retirement. I waived university-provided health insurance. Like many universities, UNC-Chapel Hill provides health insurance for students through a third-party provider unless you (or your student) opt out of this coverage. Our family has private health insurance through my husband's employer so we got a waiver for the university-sponsored insurance. This move (done four times, every year of college) saved about $5,000 over the course of my son's college career. My son worked for spending money. My son held a few jobs during college that included work at a university library and private hospitality company supporting UNC sporting events. He also raised funds to support his participation in summer-long mission trips. I'd like to say that he worked during high school and saved a lot of money for college. But he started high school during the 2008 recession and many jobs formerly suited for students (rightly) went to adults who could work 40 hours weekly. However, my son did work some odd jobs for friends and neighbors while in high school. During his college career, my son never made a huge salary. But his hourly wages helped cover many of his discretionary expenses. My son graduated in four years. There's nothing wrong with taking time to finish college, particularly if you carry a lighter load or take off a semester in order to work, travel, or get your life together. But graduating in four years (or less) can save money on living expenses and more. My son wasn't a model scholar at all times. But he was diligent in pressing forward to earn his degree despite some setbacks, a change in his college major, and the decision to get a double major. Fortunately, he started college with credit hours attributed to AP exam scores from high school classes. These bonus credits helped him stay on track to graduate in four years as he was able to drop a couple of classes and carry a lighter load for a couple of semesters. Otherwise, he may have needed to go an extra semester or more to get the required hours for graduation. A born saver, my son became even more frugal in college. 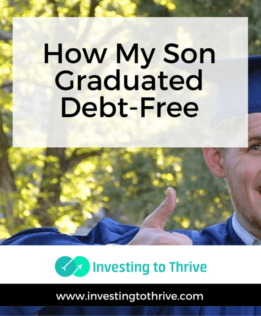 My son entered college with a healthy savings account, consisting largely of money saved from various birthday and Christmas gifts.His saving instinct continued to grow in college and moved from hoarding cash to investing and spending wisely. Though I'd like to attribute this frugality completely to my nurture, he learned practical tips for saving on textbooks, incidentals, etc. from his classmates, not me. As far as scholarships, my son didn't get any (though he tried). My college planning wasn't perfect. In hindsight, I could have saved more and strategized better at managing college finances. But my efforts did benefit our family, including my son, allowing him to graduate debt-free.